Australia, 1994, 102 minutes, Colour. Terence Stamp, Hugo Weaving, Guy Pearce, Bill Hunter, Sarah Chadwick. 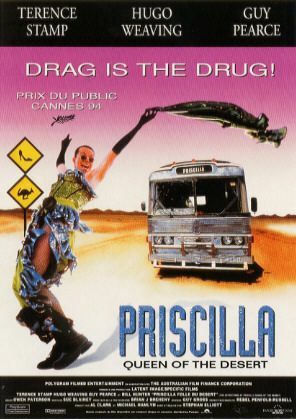 The Adventures of Priscilla, Queen of the Desert was one of the Australian film industry's world-wide successes of 1994 (along with the even more popular Muriel's Wedding). The film made an impact at the Cannes Film Festival and was taken up for festivals throughout the world and then on general release. It was also one of the top box-office films in Australia in 1994. The film was based on an idea of looking at the behind-the-scenes of the female impersonators of Darlinghurst in Sydney. However, the film-makers tried to use actual drag queens - but their timetable and their temperament were against it. Instead, Terence Stamp was persuaded to come from England to play Bernadette, the transsexual, and Hugo Weaving and Guy Pearce completed the trio of the drag queens on their journey from Sydney to Alice Springs. The perennial Bill Hunter also turns up in Coober Pedy. The film is entertaining - somewhat crass in its swearing and jokes for the general audience, but has enough good nature to help many audiences overcome a natural homophobia. One of the main attractions of the film was the costuming - and the elaborate miming sequences of a range of popular songs (concluding with Abba). The costume designers won an Oscar for their work. The film also shows the Australian countryside to great advantage, especially the Northern Territory with a climax at King's Canyon. The film was directed by Stephan Elliott, whose previous film was Frauds with Phil Collins, Hugo Weaving and Josephine Burns and who then made Welcome to Woop Woop and the thriller, Eye of the Beholder. 1. The popularity of the film? World-wide? Acclaim, Oscar for costume design? 2. The Sydney locations, the contrast with the Outback, the roads, Broken Hill and Coober Pedy? Alice Springs? The desert sequences? An overview of Australian landscapes? 3. The title, the camp style of the bus being Priscilla? The adventures of drag queens? 4. Audience response to the tradition of drag? The clubs, the audiences, participation? The songs chosen? The females imitated? Costumes, dance? Camp style? Gay atmosphere? 5. Gender issues, masculine and feminine identity? Cross‑dressing? The operation for a transsexual? Gay and straight issues? 6. The gay subculture of Sydney? The individuals? Their style? Relationships? The three drag queens as being gay? Their past stories in the flashback? Brief? Adam and his memory of his molesting uncle? Bernadette and her memory of the unexpected gift? Tick and his memories of the birth of his son - done in comic style? Their acceptance of their identity? Their place in the subculture? Coping or not? 7. The performance sequences? The range of songs and their tone? The performances on stage, on the streets, in the clubs, out in the desert? Rehearsals and performances? The jokes about Abba? 8. The humour of the film? Camp and gay? The crass language? The jokes? 9. The film's appeal against homophobia? Acceptance of the characters and their personalities - as they were? Audiences (and Australian attitudes) and the challenge? The character of Bob and his relating to the group, his memory of Les Girls? Attraction to Bernadette? The relationship with her? The macho men at Coober Pedy? The tough woman at Broken Hill and the drinking competition? Tick's wife and his son, the son and his attitude towards his father, performance, having a boyfriend? The end? 10. Tick and his performance ability, his stage name? The memories of birth - and the parody of the gay man with a son? His relationship with his wife, her offer? The divorce and the marriage settlement? Feeling that he owed her? The discussion with Bernadette, her decision to go? Adam and his performing with him? Agreeing to go? On the bus, the farewell? Tick and his hopes, his driving the bus, the arguments, the clashes, the friendships? In the desert? The bus breaking down, his rehearsal? The couple driving off in a rush? The encounter with the aborigines and sharing the dance? The serious discussions with Bernadette at the restaurant in Coober Pedy? Arrival at Alice Springs, his not telling them the complete truth about his son? His meeting his wife? Performance, achievement? The final picnic and his relating to his son, telling the truth? The return with Adam? The final performances and high spirits? A credible character? 11. Bernadette and the background of Les Girls, age, sardonic? The operation? The flashback and the memory of the gifts and his wanting the more feminine gift? His grief at Trumpet dying, his relationship with him, the funeral? Being persuaded to go for the trip? Driving, friendship with Tick, the bitching and clashes with Adam? Wandering in the desert, meeting the couple - and their hurrying away? With the aborigines? Enjoying the performances? The talking seriously with Tick in Coober Pedy? The fight with the man at Coober Pedy? The friendship with Bob, the performance, his wife? The night together? Alice Springs, the decision to stay? A credible character? 12. Adam as Felicia? Flamboyant style, performance, the buying of the bus, wealthy background, his mother buying him dresses - and wanting him to get over his phase? The memory of the lewd uncle - and the funny story about him in the bath? Driving, singing? Clashes with Bernadette? The painting of the bus? Walking the streets of Broken Hill, Coober Pedy - and going to the video shop? Flirting with the men (and Bob's ignoring of him)? The violent attack and his being bashed? His being silent? In the desert, the aborigines? The performance in Alice Springs? The friendship with Benjy, the bonds between them? The ambition to go to King's Canyon? The three and their climbing of King's Canyon? His return to Sydney? His future? Credible character? 13. Bob, the background of his Filipina wife, her tantrums, his violence towards her? Racist? His friendship with Bernadette? Encouraging them to put on the show? Fixing the bus, going with them? The bond with Bernadette, the night? His going with the boys in Coober Pedy and ignoring Adam? Later supporting him and the men turning on him? The final decision and his staying with Bernadette? 14. Bob's wife, the Filipina, her background, coming to Australia, her drinking? Performances and extroversion? Her performance in the club and everybody's reaction? Her later turning up - and separating from Bob? 15. Tick's wife, the separation, running the club at Alice Springs? Her son? Supporting Tick and the performance? Wanting to go on a holiday, entrusting Benjy to him? Benjy and his age, experience with his mother, knowledge about his father, watching the performance? The picnic, friendship with Adam? Discussing the truth with his father? 16. The people of Broken Hill and their response? The tough woman in the bar - Bernadette and the drinking competition and everybody being on their side? The contrast with the men at Coober Pedy, drinking with Bob, flirting with Felicia - and then finding out that he was a man? The poofter-bashing and the consequences? 17. The audiences in Sydney, the audiences in Coober Pedy, in Alice Springs - the polite applause and finally the acceptance of the performers? 18. A cheerful picture of the drag queens - with the subtexts of serious themes about gender and sexual identity in Australia?